Just two simple ingredients make this a yummy, sweet summer treat. Using a straw, de-stem strawberries by pushing the straw through the small end of the strawberry to the large end, removing the stem. 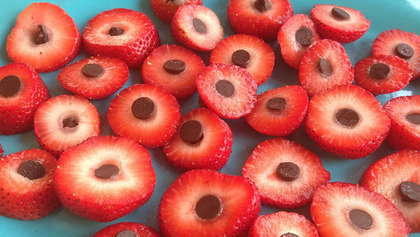 Slice strawberries into 2 or 3 rings. Place a dark chocolate chip in each center hole. Serve on a platter or plate.